Accepted for publication 19 March 2001. Published 27 March 2001. McManus, P. S., and Stockwell, V. O. 2001. Antibiotic use for plant disease management in the United States. Online. Plant Health Progress doi:10.1094/PHP-2001-0327-01-RV. In the 1950s, soon after the introduction of antibiotics in human medicine, the potential of these “miracle drugs” to work wonders on plant diseases was explored. Nearly 40 antibiotics were screened for plant disease control (12). Of the screened compounds, fewer than 10 were used commercially and only streptomycin had significant usage. For the control of certain bacterial diseases of plants, streptomycin was indeed a silver bullet. Unfortunately, just as the emergence of bacterial strains resistant to antibiotics has limited their performance in clinical settings, streptomycin resistance has destabilized plant disease control. The antibiotic resistance crisis in medicine has been widely publicized and is recognized as a major threat to controlling human bacterial diseases and infections worldwide (19, 20). Efforts to conserve the efficacy of antibiotics in medicine have drawn scrutiny to all antibiotic use within and outside the medical field, including agriculture. Concern from the general public and within the scientific community has resulted in a number of misconceptions regarding antibiotic use on plants. We describe the current use of antibiotics on plants in the U.S., the emergence of antibiotic-resistant plant pathogens, and the political upheaval regarding antibiotic use on plants. What, Where, Why, How, and To What Extent? As is the case in human and veterinary medicine, the targets of antibiotic use on plants are pathogenic bacteria and other prokaryotic microbes (e.g., phytoplasmas). Managing bacterial diseases depends mostly on host plant resistance (which may not be available in desirable crop varieties), quarantine (preventing the introduction of pathogens), sanitation (removing diseased plant tissues), and cultural practices (e.g., avoiding overhead irrigation and limiting nitrogen fertilization). In some cases, chemical bactericides (e.g., copper compounds and antibiotics) and biological control agents are effectively integrated into the disease management program. What are antibiotics and which antibiotics are used on plants? The classic definition of an antibiotic is a compound produced by a microorganism that inhibits the growth of another microorganism. Of the myriad antibiotics used in agriculture, only two are used on plants in the U.S.: streptomycin and oxytetracycline. Fig. 1. Chemical structure of (A) streptomycin and (B) oxytetracycline (click image for larger view). Streptomycin. Streptomycin (Fig. 1A) is an aminoglycoside antibiotic. The primary mechanism of action of streptomycin is binding irreversibly to bacterial ribosomes and thereby inhibiting protein synthesis. In the U.S., streptomycin use is registered on 12 plant species, but the primary uses are on apple, pear, and related ornamental trees for the control of fire blight caused by Erwinia amylovora (Table 1). Minor uses include floriculture, seed treatment, and on certain vegetable seedlings in the greenhouse and/or field. At high concentrations, streptomycin can be phytotoxic to plants; thus it is applied to the surface of plants and not injected. Oxytetracycline. Oxytetracycline (Fig. 1B) is a member of the tetracycline antibiotics. Tetracyclines inhibit protein synthesis by binding reversibly to bacterial ribosomes. This antibiotic is used primarily on peach, nectarine, and pear (Table 1). Oxytetracycline also is used on an emergency basis on apple in specific regions where streptomycin-resistant strains of E. amylovora have been documented. Tetracycline derivatives are the only antibiotics that are registered for internal use in plants. They are injected into the trunks of palm and elm trees to treat lethal yellows diseases caused by phytoplasmas (1). The injection of tetracycline into a tree is a labor-intensive and expensive treatment, which often must be repeated for abatement or delay of symptoms. Antibiotic injections are practical only for isolated high-value ornamental trees and not vast plantings of agricultural or forest trees. aData obtained from databases maintained by the USDA's National Agricultural Statistics Service (46). What quantities of antibiotics are used on plants? The Centers for Disease Control and Prevention (CDC) estimates that 50 million pounds of antibiotics are produced annually in the U.S. (20). About half of the quantity of antibiotics produced in the U.S. were dispensed to humans in the 150 million prescriptions written annually by medical doctors (20). More than 40% of the antibiotics produced annually in the U.S. are given to animals to treat or prevent infections and are mixed into feed to promote growth of agricultural animals (20). Fig. 2. Application of antibiotics to a pear orchard (click image for larger view). The combined use of streptomycin and oxytetracycline on plants accounts for about only 0.1% of all antibiotics produced annually in the U.S. In 1999, approximately 21,400 pounds of streptomycin and 21,700 pounds of oxytetracycline were applied to fruit trees in the major tree-fruit producing states (Table 1). In the 1990s, antibiotics were applied to approximately 20% of apple acreage, 40% of pear acreage, and 8% of peach and nectarine acreage nationwide (Table 1; 30). In commercial orchards, antibiotic powders are mixed in a large volume of water to a concentration of 50-200 parts per million (ppm) and applied to tree canopies with a high-pressure sprayer (Fig. 2). Regulation of antibiotic use. Antibiotic use on crops and ornamental plants is regulated in the U.S. by the Environmental Protection Agency (EPA). The registration process involves evaluation of the toxicity and carcinogenicity of a product and its derivatives and also impacts that a chemical may have on non-target species including plants, pollinating insects, aquatic organisms, and other wildlife. Regulatory decisions are not based on the efficacy of disease control. In comparison to most pesticides, streptomycin and oxytetracycline are relatively non-toxic and have been assigned the lowest toxicity rating of the EPA (11). The use of pesticides on certified organic crops is regulated by state or regional certification programs, and the National Organic Program of the United States Department of Agriculture. In certified organic farming systems, streptomycin and oxytetracycline are registered for use on pear and apple for the control of fire blight (47). Product labels state that long-sleeved shirts, pants, shoes, chemical-resistant gloves, and respirators must be worn by mixers, applicators, and persons entering an area shortly after antibiotics have been applied. Labels also specify a preharvest interval (PHI), the period of time between the last permitted application and harvest. PHIs are established to ensure that pesticide residues do not exceed a predetermined limit or “tolerance.” The PHIs for oxytetracyline and streptomycin range from 21 to 60 days, depending on the crop and antibiotic. Residue tolerances of 0.25 ppm and 0.35 ppm of streptomycin and oxytetracycline, respectively, on produce have been established by the EPA (11). Fire blight is a destructive bacterial disease of apple, pear, and related ornamental plants, in which all plant parts can become infected. Not only are crops lost, large branches and even whole trees are killed (Figs. 3-6). An apple or pear orchard may see little fire blight for several years and then succumb to an epidemic when environmental conditions are favorable. A fire blight epidemic in southwestern Michigan in 2000 is estimated to have caused losses of at least $42 million. In 1998, apple and pear growers in Washington and northern Oregon suffered an estimated $68 million in losses due to fire blight. Since 1997, approximately 500,000 pear trees have been destroyed in the Po Valley of Italy, which is the major pear production area of the world, in an effort to eradicate fire blight (4). 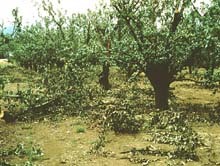 Nearly one million pear, apple, and quince trees were destroyed in Romania and Croatia during the 1990s in efforts to halt the spread of fire blight in those countries (10, 37). Fig. 3. Fire blight epidemic in Jonathan apple (click image for larger view). Fig. 4. The “shoot blight” phase of fire blight rapidly destroys the current season’s shoot growth (click image for larger view). Fig. 5. Fire blight at an apple nursery. Bags are filled with young trees lost to the disease (click image for larger view). Fig. 6. To control fire blight after infection of blossoms or shoots, infected branches must be removed. The loss of these large branches decreases fruit production and disfigures trees (click image for larger view). Fig. 7. Fire blight canker on Bosc pear (click image for larger view). To appreciate fire blight control strategies, specifically the role of antibiotics, a basic understanding of the disease is needed. The pathogen, E. amylovora, overwinters in stem cankers and infected tissues (Fig. 7). In the spring, the pathogen grows in the cankers and spreads to open blossoms by rain, wind, and insects. The pathogen multiplies rapidly on blossoms during warm, moist conditions and infects blossoms through the nectary. E. amylovora grows internally in the plant causing cell death, which is seen as wilting and blackening of the infected tissues (Figs. 8 and 9). Once these symptoms are visible, there is no effective chemical treatment for fire blight. To minimize further disease spread, the grower must prune branches at least 12 inches below the visible symptoms. Depending on where infection occurs on a tree, the result can be the loss of major fruit-bearing limbs or the entire tree (Fig. 6). Fig. 8. Fire blight symptoms, necrosis and wilting, on a blossom cluster of Bartlett pear (click image for larger view). Fig. 9. Fire blight symptoms on Bosc pear shoots (click image for larger view). Antibiotics provide a protective barrier on the surface of plants that suppresses the growth of the pathogen before infection. Streptomycin has been the antibiotic of choice for fire blight as it kills the pathogen on the plant surface. Oxytetracycline, which reduces the growth rate of pathogen but does not kill existing populations, is less effective than streptomycin (26). The length of time that an antibiotic is active on the surface of the flower is not well understood, but generally streptomycin is considered active for 3 days and oxytetracycline for 1 day after application. Timing is critical to the success of either antibiotic for fire blight control: unnecessary sprays are expensive, but an omitted spray during an infection period can set the stage for an epidemic. Growers rely on recommendations of university-based extension personnel and disease-risk models to optimize the timing of antibiotic sprays and to minimize the number of applications. While none of the models are perfect in predicting when and where fire blight will occur, they are useful management tools that have spared growers and the environment many antibiotic sprays. EPA-approved product labels recommend spraying antibiotics for fire blight control on a calendar basis, beginning during bloom and repeating every 3 to 5 days until a specified time before harvest. With that schedule, up to 15 streptomycin sprays and 10 oxytetracycline sprays could be applied. If every acre of pear in the U.S. were sprayed at the maximum dose, then 264,810 pounds of streptomycin and 88,270 pounds of oxytetracycline would be applied annually. Spraying every acre of apple in the U.S. at the maximum dose would result in application of 802,455 pounds of streptomycin and 400,221 pounds of oxytetracycline every year. Comparing these figures to those shown in Table 1 makes it clear that fruit growers are actually using less than 3% of the amount of antibiotic permitted. Although the amount of antibiotics used on plants is small compared to medical, veterinary, and agricultural animal production uses, streptomycin-resistant plant pathogens have emerged (Table 2), which further complicates the control of bacterial diseases of plants. Surveillance for antibiotic-resistant plant pathogens has been sporadic and usually undertaken only after an antibiotic failed to control the disease. Many if not most surveys for streptomycin-resistant E. amylovora have come up negative (13, 15); Table 2 shows only positive results. Surveys have not detected oxytetracycline resistance in E. amylovora (22, 36). aSuperscripts refer to the literature citations in which resistance was documented. In E. amylovora, two distinct types of streptomycin resistance have been described (6, 7, 8, 15): i) a mutation in the chromosomal gene rpsL which prevents streptomycin from binding to its ribosomal target; and ii) inactivation of streptomycin by an enzyme encoded by strA and strB. The level of resistance conferred to the bacterium is greater from the chromosomal mutation, which renders the cell insensitive to the antibiotic, than from the production of the enzyme that inactivates streptomycin (39). It should be noted, however, that the level of resistance conferred by the enzyme is still about five times greater than the concentration at which streptomycin is used in the field. Streptomycin resistance in most strains of E. amylovora has been attributed to chromosomal mutation because the majority of resistant isolates obtained from different locations do not harbor strA-strB. However, quantitative surveys to determine the relative prevalence of the resistance mechanisms in various geographical regions have not been undertaken. Molecular studies show that the chromosomal mechanism of resistance has arisen independently in E. amylovora multiple times (8, 27). The genes strA and strB usually reside on plasmid-borne transposons, which are mobile pieces of DNA that are generally not required for basic bacterial functions but that frequently carry antibiotic resistance genes. Transposon Tn5393 carries strA and strB in streptomycin-resistant strains of Erwinia, Pseudomonas, and Xanthomonas on plants (3, 6, 13, 14, 15, 31, 35, 40, 43, 44). StrA and strB also have been identified in at least 17 environmental and clinical bacteria populating diverse niches (43, 44), and in most cases, the genes are on plasmids. In bacteria associated with animals, the plasmids carrying genes for streptomycin resistance are usually small (<10 kb) and able to exist in a broad range of bacterial species. Although these small plasmids do not have the genes necessary to move from cell to cell, they can be transferred with help from other bacterial gene products. In contrast, the streptomycin resistance plasmids in plant-associated bacteria are usually large (>30 kb), relatively specific for certain bacterial host species, and able to accomplish their own cell-to-cell transfer. In fact, the most common resistance plasmid in E. amylovora is identical to a resistance plasmid found in Pantoea agglomerans (formerly called Erwinia herbicola), a nonpathogenic bacterial species that is common in orchards, (3, 13, 15, 40). This has led to the hypothesis that E. amylovora acquired the plasmid carrying genes for resistance to streptomycin from its nonpathogenic cohorts (3, 6, 15). Indeed, transfer of the resistance plasmid from P. agglomerans to E. amylovora was accomplished in vitro (6). Transfer in planta, however, has not been demonstrated. This coupled with the observation that strains of P. agglomerans carrying streptomycin resistance plasmids have been isolated from the same plant tissues as strains of E. amylovora sensitive to streptomycin suggests that transfer of antibiotic resistance plasmids in the field is not common (3). Likewise, in laboratory studies, resistance plasmids in P. agglomerans were not transferred to other strains of P. agglomerans or to Pseudomonas syringae pv. syringae (13). An exception to the rule of relatively large resistance plasmids in plant-associated bacteria is the discovery of a small plasmid, similar to the broad host range plasmid RSF1010, in a few isolates of E. amylovora (15, 32). Regardless of the mechanisms, streptomycin resistance appears to be a stable trait in plant pathogenic bacteria. A survey of celery beds in Florida in the early 1990s detected widespread resistance to streptomycin among isolates of Pseudomonas cichorii, the causal agent of bacterial blight, even though streptomycin had not been used commercially for disease control since the late 1960s (33). Streptomycin-resistant isolates of E. amylovora were detected in an orchard in California 10 years after applications of the antibiotic were halted (29). Similarly, streptomycin-resistant strains of E. amylovora remain widespread in Washington state (Stockwell et al., unpublished data) even though usage of the antibiotic decreased dramatically in the 1990s after it was reported that 88% of the surveyed orchards harbored resistant strains (22). Perhaps “compensatory mutations,” a phenomenon described in streptomycin-resistant Escherichia coli (18), account for the stability of streptomycin-resistant plant pathogen populations in the absence of selection. In this scenario, chromosomal mutations for antibiotic resistance may initially inflict a fitness burden to the bacterium. However, as the bacterium evolves in the absence of selection, it undergoes mutations that ameliorate the fitness costs. The end result of compensatory mutations is an increase in the frequency and persistence of antibiotic resistance genes. Does antibiotic use on plants pose a risk to human health? This question is the subject of contentious debate in the U.S., Europe, and elsewhere. One consumer advocacy group in the U.S. has gone so far as to call for a ban on antibiotics used as pesticides (21). Growers, however, defend their practice as being so limited in scope as to be inconsequential to the emergence of antibiotic resistance in hospitals and communities. With almost no research data to uphold either view, arguments are frequently based on circumstantial evidence and fueled by passion. The greatest concern of those opposed to antibiotic use on plants is that spraying antibiotics in the open environment and over physically large expanses of land might increase the frequency of antibiotic resistance genes; not just streptomycin- and tetracycline-resistance genes but any other resistance genes that might be carried on the same plasmid, thereby increasing the risk of these genes finding their way into medically important bacteria. This would require the transfer of resistance genes from plant- and soil-borne bacteria to bacteria that reside on or in humans. The transfer would have to occur somewhere between the orchard and the human skin or gut, in an environment sufficiently favorable to both the gene donor and the recipient. In laboratory studies, transfer of a tetracycline-resistance plasmid among enteric bacteria (Escherichia coli, Erwinia spp., Salmonella typhimurium, and Shigella dysentariae) originating from humans and plants occurred at various frequencies, and E. herbicola (now classified as P. agglomerans) was especially promiscuous (5). Several subsequent studies confirmed the in planta transfer and stability of antibiotic resistance plasmids among plant-associated bacteria (16, 17, 23). It is important to note, however, that the broad-host-range resistance plasmids used in these studies originated in bacteria isolated from humans, not plants. In addition to transfer of resistance genes from environmental bacteria to “human” bacteria, the genes would have to be functional in their new bacterial host in order to wreak havoc. We are aware of only one study in which this issue was addressed. Schnabel and Jones (36) found that streptomycin and tetracycline resistance genes were often carried on the same large plasmid in orchard bacteria, but when the plasmid was put into E. coli, the new host was resistant only to tetracycline and not to streptomycin or 10 other antibiotics. Recently a Mexican company attempted to register an agricultural formulation of gentamicin with the U.S. EPA, primarily for fire blight control. The product is currently used on a variety of crops in Mexico and Central America and suppresses fire blight in field tests. Gentamicin, however, is a critical tool in human medicine, used alone or in combination with other drugs for treatment of various infections. In its evaluation of the product, EPA called on experts from CDC. The result of the consultation was that all antibiotic use on plants was called into question. In October 1999, the application for registration of gentamicin on crop plants in the United States was withdrawn. At this point, streptomycin and oxytetracycline have been used on crop plants for the past 45 years and 25 years, respectively, without reports of adverse effects on humans. The efficacy of these silver bullets for control of plant diseases has been diminished in some regions due to the emergence of antibiotic-resistant strains of pathogens. However, until effective and economic alternatives become available, antibiotics will remain important tools for the management of some of the most devastating plant diseases. 1. Agrios, G. N. 1997. Plant Pathology, 4th Edition. Academic Press, San Diego. 2. Burr, T. J., Norelli, J. L., Katz, B., Wilcox, W. F., and Hoying, S. A. 1988. Streptomycin resistance of Pseudomonas syringae pv. papulans in apple orchards and its association with a conjugative plasmid. Phytopathology 78:410-413. 3. Burr, T. J., Norelli, J. L., Reid, C. L., Capron, L. K., Nelson, L. S., Aldwinckle, H. S., and Wilcox, W. F. 1993. Streptomycin-resistant bacteria associated with fire blight infections. Plant Dis.77:63-66. 4. Calzolari, A., Finelli, F., and Mazzoli, G. L. 1999. A severe unforeseen outbreak of fire blight in the Emilia-Romagna region. Acta Hortic. 489:171-176. 5. Chatterjee, A. K., and Starr, M. P. 1972. Transfer among Erwinia spp. and other enterobacteria of antibiotic resistance carried on R factors. J. Bacteriol. 112:576-584. 6. Chiou, C.-S., and Jones, A. L. 1993. Nucleotide sequence analysis of a transposon (Tn5393) carrying streptomycin resistance genes in Erwinia amylovora and other gram-negative bacteria. J. Bacteriol. 175:732-740. 7. Chiou, C.-S., and Jones, A. L. 1995. Expression and identification of the strA-strB gene pair from streptomycin-resistant Erwinia amylovora. Gene 152:47-51. 8. Chiou, C.-S., and Jones, A. L. 1995. Molecular analysis of high-level streptomycin resistance in Erwinia amylovora. Phytopathology 85:324-328. 9. Coyier, D. L., and Covey, R. P. 1975. Tolerance of Erwinia amylovora to streptomycin sulfate in Oregon and Washington. Plant Dis. Rep. 59:849-852. 10. Cvjetkovic, B., Halupecki, E., and Spoljaric, J. 1999. The occurrence and control of fire blight in Croatia. Acta Hortic. 489:71-73. 11. EPA Office of Pesticide Programs. 2000. Pesticide reregistration eligibility decisions (REDs) fact sheets. Online. 12. Goodman, R. N. 1959. The influence of antibiotics on plants and plant disease control. Pages 322-448 in: Antibiotics: Their Chemistry and Non-Medical Uses. H. S. Goldberg, ed. D. van Nostrand and Company, Inc. Princeton, NJ. 13. Huang, T. C., and Burr, T. J. 1999. Characterization of plasmids that encode streptomycin-resistance in bacterial epiphytes of apple. J. Appl. Microbiol. 86:741-751. 14. Jones, A. L., Norelli, J. L., and Ehret, G. R. 1991. Detection of streptomycin-resistant Pseudomonas syringae pv. papulans in Michigan apple orchards. Plant Dis. 75:529-531. 15. Jones, A. L., and Schnabel, E. L. 2000. The development of streptomycin-resistant strains of Erwinia amylovora. Pages 235-251 in: Fire Blight: the Disease and its Causative Agent Erwinia amylovora. J. Vanneste, ed. CAB International. 16. Lacy, G. H., Stromberg, V. K., and Cannon, N. P. 1984. Erwinia amylovora mutants and in planta-derived transconjugants resistant to oxytetracycline. Can. J. Plant Pathol. 6:33-39. 17. Lai, M., Shaffer, S., and Panopoulos, N. J. 1977. Stability of plasmid-borne antibiotic resistance in Xanthomonas vesicatoria in infected tomato leaves. Phytopathology 67:1527-1530. 18. Levin, B. R., Perrot, V., and Walker, N. 2000. Compensatory mutations, antibiotic resistance and the population genetics of adaptive evolution in bacteria. Genetics 154:985-997. 19. Levy, S. B. 1992. The Antibiotic Paradox: How Miracle Drugs are Destroying the Miracle. Plenum Press, New York. 20. Levy, S. B. 1998. The challenge of antibiotic resistance. Sci. Am. 278:46-53. 21. Lieberman, P. B., and Wootan, M. G. 1998. Protecting the crown jewels of medicine: A strategic plan to preserve the effectiveness of antibiotics. Online. Center for Science in the Public Interest Documents Library Reports. 22. Loper, J. E., Henkels, M. D., Roberts, R. G., Grove, G. G., Willett, M. J., and Smith T. J. 1991. 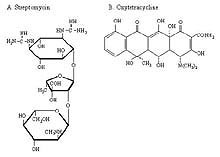 Evaluation of streptomycin, oxytetracycline, and copper resistance of Erwinia amylovora isolated from pear orchards in Washington State. Plant Dis. 75:287-290. 23. Manceau, C., Gardan, L., and Devaux, M. 1986. Dynamics of RP4 plasmid transfer between Xanthomonas campestris pv. corylina and Erwinia herbicola in hazelnut tissues, in planta. Can. J. Microbiol. 32:835-841. 24. Manulis, S., Zutra, D., Kleitman, F., David, I., and Zilberstaine, M. 1999. Streptomycin resistance of Erwinia amylovora in Israel and occurrence of fire blight in pear orchards in the autumn. Acta Hortic. 489:85-87. 25. Manulis, S., Zutra, D., Kleitman, F., Dror, O., Zilberstaine, M., and Shabi, E. 1998. Distribution of streptomycin-resistant strains of Erwinia amylovora in Israel and occurrence of blossom blight in the autumn. Phytoparasitica 26:223-230. 26. McManus, P. S., and Jones, A. L. 1994. Epidemiology and genetic analysis of streptomycin-resistant Erwinia amylovora from Michigan and evaluation of oxytetracycline for control. Phytopathology 84:627-633. 27. McManus, P. S., and Jones, A. L. 1995. Genetic fingerprinting of Erwinia amylovora strains isolated from tree-fruit crops and Rubus spp. Phytopathology 85:1547-1553. 28. Minsavage, G. V., Canteros, B. I., and Stall, R. E. 1990. Plasmid-mediated resistance to streptomycin in Xanthomonas campestris pv. vesicatoria. Phytopathology 80:719-723. 29. Moller, W. J., Schroth, M. N., and Thomson, S. V. 1981. The scenario of fire blight and streptomycin resistance. Plant Dis. 65:563-568. 30. National Agricultural Statistics Service. 1997. Agricultural Chemical Usage, 1995 Fruits Summary. No. 96172. U.S. Dept. Agriculture. 31. Norelli, J. L., Burr T. J., Lo Cicero, A. M., Gilbert M. T., and Katz B. H. 1991. Homologous streptomycin resistance gene present among diverse Gram-negative bacteria in New York state apple orchards. Appl. Environ. Microbiol. 57:486-491. 32. Palmer, E. L., Teviotdale, B. L., and Jones, A. L. 1997. A relative of the broad-host-range plasmid RSF1010 detected in Erwinia amylovora. Appl. Environ. Microbiol. 63:4604-4607. 33. Pohronezny, K., Sommerfeld, M. L., and Raid, R. N. 1994. Streptomycin resistance and copper tolerance among strains of Pseudomonas cichorii in celery seedbeds. Plant Dis. 78:150-153. 34. Saad, A. T., Hanna, L. , and Choueiri, E. 2000. Evaluation of streptomycin and oxytetracycline resistance of Erwinia amylovora populations in Lebanon. Phytopathology 90:S68 (Abstr.). 35. Scheck, H. J., Pscheidt, J. W., and Moore, L. W. 1996. Copper and streptomycin resistance in strains of Pseudomonas syringae from Pacific Northwest nurseries. Plant Dis. 80:1034-1039. 36. Schnabel, E. L., and Jones, A. L. 1999. Distribution of tetracycline resistance genes and transposons among phylloplane bacteria in Michigan apple orchards. Appl. Environ. Microbiol. 65:4898-4907. 37. Severin, V., Constantinescu, F., and Jianu, F. 1999. Appearance, expansion, and chemical control of fire blight (Erwinia amylovora) in Romania. Acta Hortic. 489:79-84. 38. Shaffer, W. H., and Goodman, R. N. 1985. Appearance of streptomycin-resistant Erwinia amylovora in Missouri apple orchards. Phytopathology 75:1281. 39. Shaw, K. J., Rather, P. N., Hare, R. S., and Miller G. H. 1993. Molecular genetics of aminoglycoside resistance genes and familial relationships of the aminoglycoside-modifying enzymes. Microbiol. Rev. 57:138-163. 40. Sobiczewski, P., Chiou, C.-S., and Jones, A. L. 1991. Streptomycin-resistant epiphytic bacteria with homologous DNA for streptomycin resistance in Michigan apple orchards. Plant Dis. 75:1110-1113. 41. Stall, R. E., and Thayer, P. L. 1962. Streptomycin resistance of the bacterial spot pathogen and control with streptomycin. Plant Dis. Rep. 46:389-392. 42. Stockwell, V. O., Sugar, D., Spotts, R., Johnson, K. B., and Loper J. E. 1996. Recovery of streptomycin-resistant isolates of Erwinia amylovora from Oregon orchards. Phytopathology 86:S50 (Abstr). 43. Sundin, G. W., and Bender, C. L. 1996. Dissemination of the strA-strB streptomycin resistance genes among commensal and pathogenic bacteria from humans, animals, and plants. Mol. Ecol. 5:133-143. 44. Sundin, G. W., and Bender, C. L. 1996. Molecular genetics and ecology of transposon-encoded streptomycin resistance in plant pathogenic bacteria. In: Molecular Genetics and Evolution of Pesticide Resistance. T. M. Brown, ed. American Chemical Society, Washington D.C.
45. Thomson, S. V., Gouk, S. C., Vanneste, J. L. Hale, C. N., and Clark R. 1993. The presence of streptomycin resistant strains of Erwinia amylovora in New Zealand. Acta. Hortic. 338:223-225. 46. USDA National Agricultural Statistics Service. 2000. Agricultural Chemical Usage Reports (PCU-BB). Online. Agricultural Statistics Board. 47. USDA National Organic Program. 2000. National Standards on Organic Agricultural Production and Handling, Subpart G (Administration), National List of Allowed and Prohibited Substances. Online. Agricultural Marketing Service. 48. Young, J. M. 1977. Resistance to streptomycin in Pseudomonas syringae from apricot. N. Z. J. Agric. Res. 20: 249-251. Alliance for the Prudent Use of Antibiotics. 1999. Pierce, Kevin. 2000. Protecting Florida's citrus industry. Online. Floridaenvironment.com Radio Programs. Also, related links. Hansen, M. 1999. Fire blight destruction spreading around the world. Online. Good Fruit Grower. April 15, 1999. Longstroth, M. 2000. The fire blight epidemic in southwest Michigan. Online. Michigan State University Extension, Van Buren County. McManus, P. S., and Stockwell, V. O. 2000. Antibiotics for plant disease control: silver bullets or rusty sabers? Online. APSnet Features. American Phytopathological Society. June 2000. Crop Data Management Systems, Inc. 2001. Labels and MSDS. University of California. 2001. Disease Model Database: Fire Blight. California Pestcast. Statewide IPM Project.